Chris Bruno was raised in the rolling green hills of Southern Virginia by professional artists. His father is a photographer, his mother a painter; thus, he was genetically predisposed to the artist’s life and temperament. He traveled with his parents to the art shows they exhibited in throughout his childhood, developing a strong aesthetic from all the exposure to different art mediums, different artists and being on the road and ‘seeing’. His earliest fascination was with cameras and photography, developing a following and earning his living through imagery that way. He continues to live near his parents and began visiting his mother in her studio a few years back. He would noodle around with painting, but found the process satisfying and began to lay the foundations for his painting career to begin. 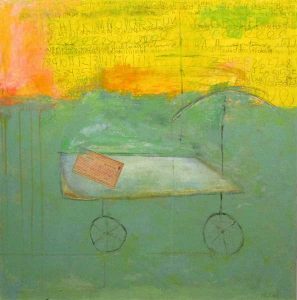 Although he has a studio at his home, he often shares space and conversations about painting with his mother, finding the camaraderie satisfying. All sorts of experiments and layers of thoughts play into Chris’s paintings. 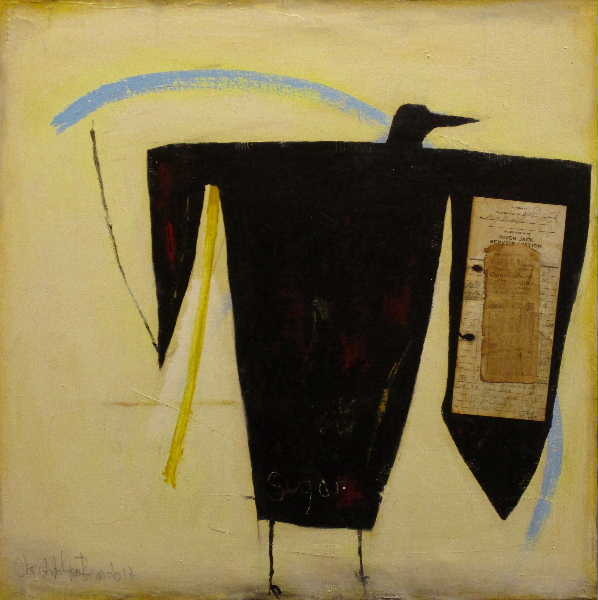 He uses acrylics, graphite and layering with papers, fabrics or sometimes other found objects. Acrylic Paint, Graphite, Collage Elements on Stretched Canvas. Acrylic Paint, Collage Elements, on Stretched Canvas.